Famous Chihuahuas. How Many Do You Recognize? Famous Chihuahuas list, some recognizable, and some maybe not so recognizable but nonetheless Famous. Have you ever wondered about those little 4 leggers owned by 2 leggers? The Chihuahua has been a very popular dog breed for many many years with very little credit given them (I might add). I know there are many more that can be added to this list. Did you know Marilyn Monroe owned a Chihuahua, although after a great deal of research I have been unable to learn what she named him. Tinkerbell Hilton and Bambi, Paris Hiltons Chihuahuas. Tinkerbell is the "author" of "Tinkerbell Hilton Diaries"
Celine, Mr G's pet chihuahua from the ABC's tv series "Summer Heights High"
Once again Boo Boo the Chihuahua is crowned the Guiness Book record holder as the worlds smallest living dog. 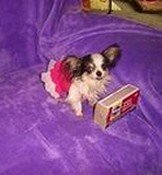 She is a long haired female Chihuahua owned by Lana Elswick of Raceland, Kentucky. Boo Boo, born on April 15, 2006 is 4 inches tall, 6.5 inches long and weighs 24 ounces. Congratulations to Lana and Boo Boo.